Call A to Z Entertainment, Inc. today for free information about how to hire or book country music band The Time Jumpers. Having helped hundreds of clients, we are your best agency and agent booking and hiring country musicians The Time Jumpers! We book or help you hire any live professional entertainment you want, to include live country music singers, bands, and country musicians. We can also help you plan and produce your event or show. So call us today at 888-655-4575 and we’ll be happy to help you. Tap any member of The Time Jumpers on the shoulder and the face that turns to greet you will be that of one who’s made major contributions to the richness and vigor of country music. 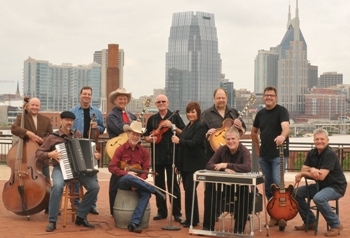 The Time Jumpers band was established in Nashville in 1998 by an assemblage of high-dollar studio musicians who wanted to spend some spare time drinking beer and jamming with their sonically gifted buddies. The notion of building a rabidly devoted following was the last thing on their minds. But that’s what happened. Learning that Monday evenings were the slowest in the week for the Station Inn bluegrass club, the superpickers settled into that fabled venue at the start of each week and set up shop. Pretty soon Monday nights were sounding a lot like Saturday nights—and drawing commensurately lively crowds. As word spread along Music Row that something special was happening at Station Inn, big stars began dropping by, some to sit in with the band, others just to enjoy the vast array of country, swing, jazz and pop standards The Time Jumpers rejoiced in playing. Among those drop-bys were Bonnie Raitt, Reba McEntire, Norah Jones, Robert Plant, The White Stripes, Kings Of Leon, Jimmy Buffet, and Kelly Clarkson. None asked for their money back. 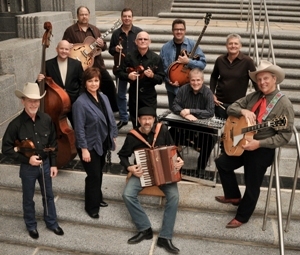 The current edition of The Time Jumpers includes 11 members, each a master of his instrument. Alphabetically—which is the only diplomatic way to present such a phalanx of evenly matched talent—they are Dennis Crouch (upright bass), Larry Franklin (fiddle), Paul Franklin (steel guitar), Vince Gill (vocals, electric and acoustic guitars), “Ranger Doug” Green (vocals, acoustic rhythm guitar), Andy Reiss (electric guitar), Kenny Sears (vocals, fiddle), Joe Spivey (fiddle, vocals) Jeff Taylor (accordion, piano) and Billy Thomas (drums, vocals). To list the artists these pickers have recorded and toured with would be tantamount to posting all the Billboard country charts for the past 30 years. Suffice it to say that the list ranges from Ray Price to John Anderson to Carrie Underwood. And the stages these luminaries have graced extend from the Grand Ole Opry to Carnegie Hall. That there are three fiddles in the band is a tip off that these guys have an overwhelming affection for western swing. The Time Jumpers—the band’s new and first album for Rounder Records—is also the group’s first studio project. Their live album—Jumpin’ Time, released in 2007—earned them two Grammy nominations and a high-profile segment on National Public Radio’s All Things Considered. The new Rounder album reveals a side of The Time Jumpers that’s largely gone unheralded—that is the members’ ability to write vivid new songs in the stylistic vein of the standards they love to perform, whether they’re breezy, euphoric dance tunes or mournful testimonies to the destructive power of love. Let’s start with Larry Franklin’s fiddle fantasia, “Texoma Bound.” Talk about music made visible! You can almost see tiny figures skipping along the tips of ocean waves as the three fiddles race along at breakneck speed, sometimes in unison, sometimes veering away from formation like the Blue Angels in flight. Jeff Taylor’s accordion flourishes gives the fiddles a run for their money. Even Bob Wills would have been dazzled by this one. Kenny Sears’ “Nothing But The Blues” turns a purely personal problem into a danceable moment as he bemoans a lover gone astray, a situation complicated by his best friend who’s giving her comfort. Depression never sounded so good. “Ranger Doug” Green—“the idol of American youth” in his customary role as front man for Riders In The Sky—channels the sounds and imagery of Sons Of The Pioneers in his “Ridin’ On The Rio,” the tale of a wandering cowboy and the senorita who waits for him back home. Vince Gill, the 20-time Grammy winner and member of the Country Music Hall of Fame and the Nashville Songwriters Hall of Fame, contributes five songs. “Faint Of Heart” is a smooth, smoky, jazz-inflected rumination on the theme that love tales real commitment and stamina. “The Woman Of My Dreams” ponders the irreplaceable loss of the ideal lover, a bleak mood further darkened by Paul Franklin’s mournful steel guitar. Gill turns flirtatious, however, in the bouncy “On The Outskirts Of Town,” inviting a lady of some experience to join him in the myriad delights of the Twilight roadhouse, where “they love to play the jukebox loud.” It’s quite an impressive sales pitch. The three remaining songs are from outside the band. Mundo Earwood’s “Texas On A Saturday Night” features Kenny and Dawn Sears singing alternating verses and paints such an irresistible picture of good times that you’d think it was commissioned by the Texas Chamber of Commerce. Johnny Mercer and Robert Emmet Dolan’s “Yodel Blues” is a perfect showcase for the vocal gymnastics of Ranger Doug, Dawn, and Vince as they contrast the differences between the New York City and Texas ways of life. There’s no surprise as to which locale comes out on top. Harlan Howard and Bill Hervey’s “Someone Had To Teach You” was recorded earlier by George Strait and Wade Hayes. Here Dawn gives the song a decidedly feminine twist in which it’s the man—not the woman—who has to be taught how to cry. It’s a fitting way to wrap up this extraordinary album by The Time Jumpers! With over twenty years of successful experience, we’re your best agency and agent for booking and hiring country music all star band the Time Jumpers, so call 888-655-4575 today and we’ll be happy to help you. We can help you book and hire any live country music bands or country singers in addition to those you see here on our site. We’re not the exclusive booking agency of any live entertainers on this site, but we’re one of the best!